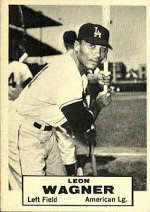 I was starting my research for this post, which covers the "1961" Topps Dice Game set, when I discovered-very much to my surprise-that I had not posted anything in depth on this subject. Given the near mythic status these have attained and the stratospheric prices even low grade examples have been bringing, the time is indeed here to dive in. 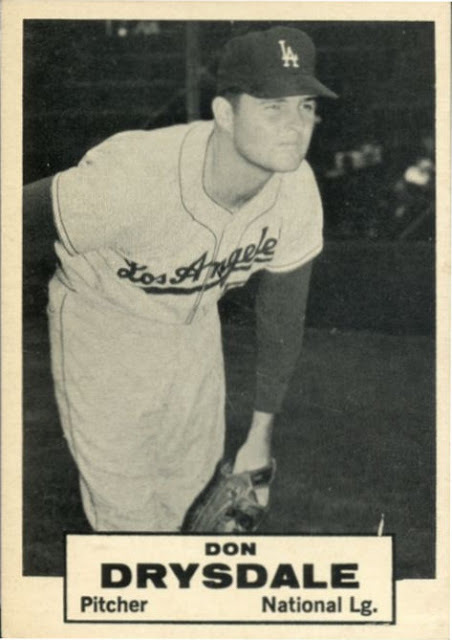 The cards don't have any indication they were made by Topps but the photography and especially the typography undoubtedly peg them as one of theirs. 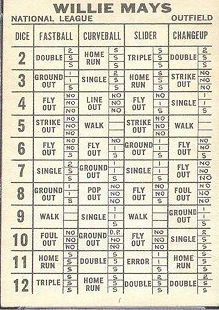 Long attributed to 1961, apparently for their alleged resemblance to the regular issue cards from that august year and possibly due to (an irrelevant) set count, the 18 black and white cards that make up this unissued set were designed to allow a game of baseball to be played by two youthful enthusiasts. 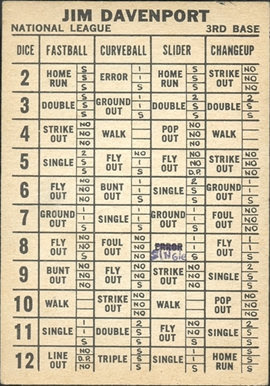 No doubt influenced by two dice based baseball games, namely ABPA, founded in 1951) and (probably more-to-the-point) Strat-O-Matic, which debuted in 1961, Topps developed and possibly tested Dice Game in the early 60's. If there was a test, my guess it was in a research lab setting and not at retail. Len Brown however, seems to indicate in an old interview that the set was retail tested but given how the surviving examples present and the general lack of cards, I just don't think that's accurate. That's essentially the organized hobby knowledge of the set! There is a little bit more that can be added though. In a Sports Market Report for PSA, Kevin Glew interviewed (via email) a couple of us hobby types (including moi) trying to pin down, among other things, exactly when the set was produced. 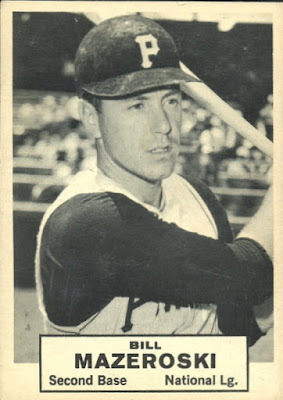 My own thoughts were the cards resembled those being designed for internal use by Topps starting around 1965 while noted collector (and Friend o'the Archive) Bob Fisk opined that the set was probably intended for issue in 1962 or '63 due to a player selection that included 16 1962 All Stars and two other players (Tony Kubek and Bill White) who put together campaigns that should have landed them in the Midsummer Classic. (Update 3/6/19-the dating has been confirmed as post 1961, a post will be made in April 2019 explaining. I have previously posted here my thoughts that the Dice Game could have been intended for sale in set form with a pair of dice and and possibly a scoresheet but that has never been confirmed. Two later examples make the possibility of complete set marketing a 50/50 proposition I think. 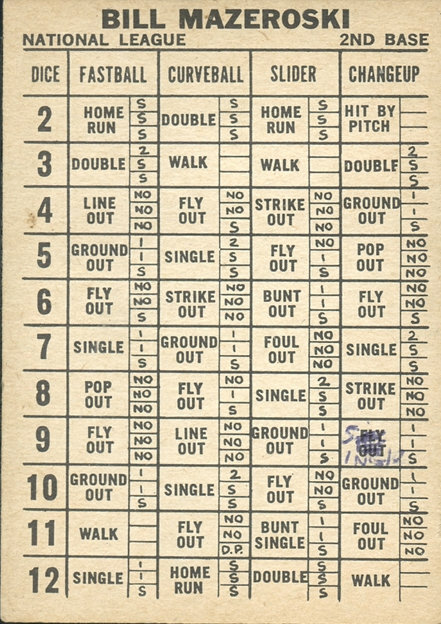 The 1966 Baseball Punchouts, which are even rarer than the Dice Game cards, seem like they were intended to be sold piecemeal while the 1968 Batter Up box set took the baseball game inserts from the 1968 Baseball packs and packaged them all up at once, with box-back instructions on how to play a nine inning contest. The Punchouts were also an 18 card set, although designed as panels that each featured an AL and NL player and could be split apart and seem to me to be the next logical step in the Topps quest to issue a standalone game product. In fact, it's possible the Dice Game cards were a kind of prototype for the Punchouts but there are a couple of key differences as the latter were printed in color (except for the small player photos on each) and there is a wrapper proof or two known. Right now there are 15 documentable subjects of 1961 Dice Game out there, while the checklist definitively stands at 18; no packaging has ever been seen to my knowledge. I'm sure these missing three cards exist as the checklist is derived from an 18 card uncut sheet owned by Fritsch Cards and which was in their possession as of April 2018 (and likely still is). 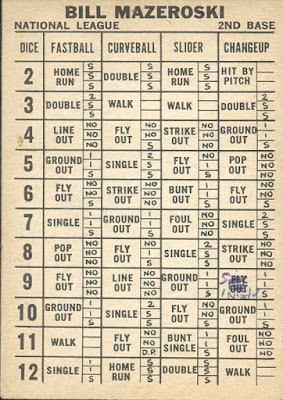 Examples not on this sheet can be found with staple holes (from internal Topps memoranda no doubt) or not, and some are hand cut. I'm pretty sure an example or two once resided in a Woody Gelman "Idea Book" but have now been liberated from whatever page they resided upon. 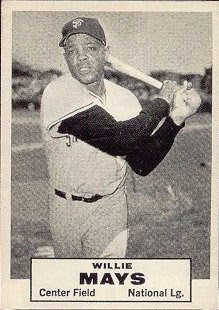 I doubt there's more than four of any one card in existence and only some subjects are known as multiples. Hopefully the missing three scans turn up soon. If they do, I'll post again to complete the visual checklist. 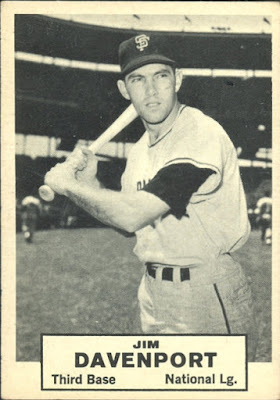 The Kaline picture is the same as on his 1957 card, I think. The Wagner hat is airbrushed with what looks more like a Dodgers cap than an Angels one. The Wagner card may indicate that the set was made when the Angels logo was still unknown.